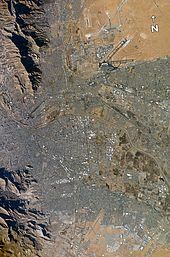 ↑ "History of Ciudad Juárez". El Paso County Historical Society. （原先內容喺October 9, 2011歸檔）. 喺November 5, 2011搵到. ↑ "The Borderplex Alliance –". El Paso Regional Economic Development Corporation. 2013. （原先內容喺2013年9月18號歸檔）. 喺September 22, 2013搵到.